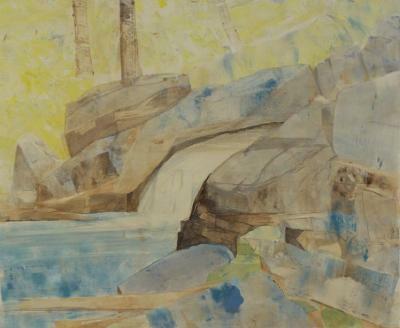 Gail Flanery, Grayling Basin , oil viscosity , 12 in X 16 in, 2014. Gail Flanery, Morning , oil viscosity , 13 in X 20 in, 2015. Hawk Distance II, oil viscosity , 10.5 in X 13.5 in, 2016. Stephen Maine, Pitched Planes 118, Printmaking, 24 in X 19 in, 2003. 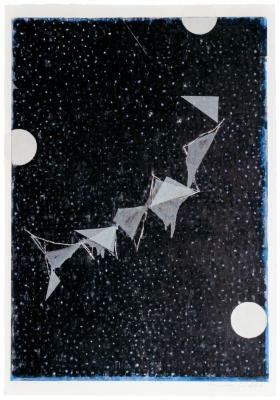 Stephen Maine, Pitched Planes 121, Printmaking, 24 in X 19 in, 2004. Agnes Murray, Roanheads #9, Monoprint, 20 in X 26 in, 2005. Agnes Murray, Roanheads #10, Monoprint, 20 in X 26 in, 2005. 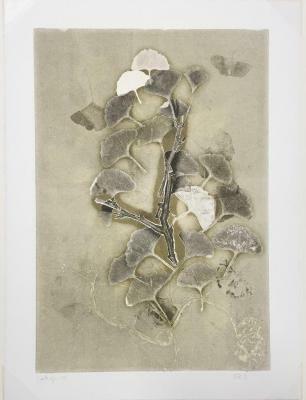 Susan Rowland, Ginkgo, Monoprint, 30 in X 22.5 in, 2006. 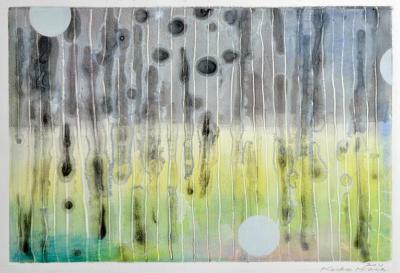 Susan Rowland, Petasites, Monoprint, 22 in X 30 in, 2006. Susan Rowland, Cat Briar, Monoprint, 22 in X 30 in, 2006. Susan Rowland, Dandylion, Monoprint, 22 in X 30 in, 2006. Susan Rowland, Moss, Monoprint, 11 in X 15 in, 2006. 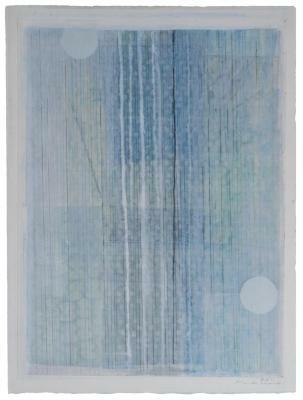 Susan Rowland, Ice, Monoprint, 15 in X 22 in, 2006. 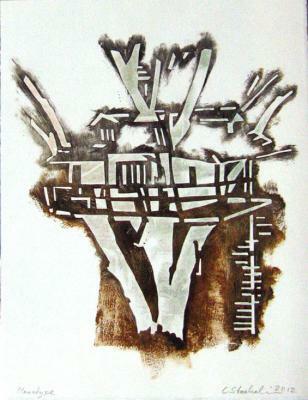 Christine Staehelin, Treehouse, Monoprint, 13 in X 10 in, 2012.